The Southeastern Conference will host the 2019 SEC Gymnastics Championship at the Smoothie King Center in New Orleans! One ticket will allow admittance to both sessions. Patrons will be allowed to leave and re-enter at designated areas located at the North 100 Level Entrance and the North East and North West Ground Entrances. Tailgating is permitted in Lot 3A but is prohibited inside all other Parking Garages on the complex. Click here for a map of parking at the complex. 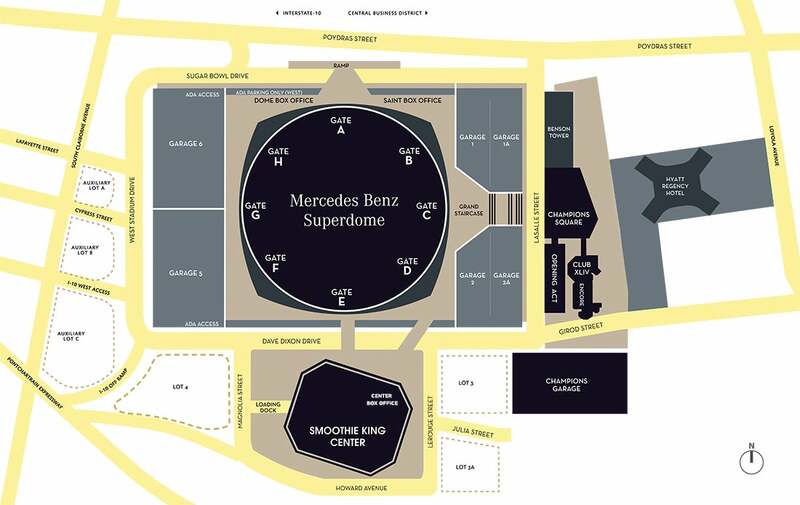 Garages 2, 2A, 5, 6, Champions Garage, and Lot 3A will be available for parking on event day for $20.00. Lot 3 will be available for ADA and oversized vehicles on event day for $20.00 - $60.00. Ticket Sales and Will Call will be open on event day at the Main Smoothie King Center Box Office from 11:00 AM - 8:00 PM. Video cameras and professional cameras with lenses longer than 6" are not allowed.